Image caption Lord Dafydd Elis-Thomas: "...there are other people now who have ministerial experience, so the leader has plenty of choice." 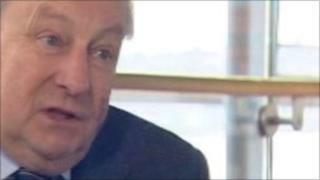 Welsh assembly presiding officer Lord Dafydd Elis-Thomas has cast doubt on whether he'll remain in the role if re-elected as an AM next May. He told the Politics Show Wales it was "unlikely" he would be in the position after next the assembly elections. "It's always been my policy never to say yes or no to such questions. "Clearly, I've done three terms - I would say that if I was a betting man, I would say it's unlikely for someone to have a fourth term," he said. "But of course it's a political decision, it depends very much on the make up of the assembly - it's the first election when we come back and it's an election among members and I'm in the hands of colleagues really on this." However, Lord Elis-Thomas wouldn't rule out the prospect of a cabinet position in the event of another Labour-Plaid Cymru coalition government in Cardiff Bay. "That's not a matter for me but a matter for my party leader after the election," he said. "There are things I am quite passionate about out there. I've lived all my life in Snowdonia. I have very strong views about the way I think the Welsh environment should be safeguarded and protected. "I've always lived among the farming community - I've always had a longstanding interest in education - so there are things I would be perhaps qualified to do. "But there are other people now who have ministerial experience, so the leader has plenty of choice, again it's a matter for him. "It's a very healthy thing really where people can't pursue their own naked ambition, they have to depend, get their colleagues to elect and select them." On the wider issue of coalition governments both in London and Cardiff, he said it was what the electorate wanted and in the light of the tuition fees vote at Westminster, he didn't like accusations of politicians breaking their promises. "I think the electorate in Wales and the electorate of the UK wanted politicians to work together and I think the benefit that comes from that outweighs any sense that people have broken their promises because it's not breaking a promise to go into a new relationship with another party so that people work together for the common good. "That to me is an important moral stand when you say we don't believe in arguing with each other any more, we want to make things work for the good of all especially in an economic crisis and that's what we've seen."